You might have stumbled across something called a tension diamond or gemstone ring and wondered what it is. This guide should help you understand exactly what type of style it is as well as the materials and gemstones typically associated with tension rings. Basically, this is everything you need to know about tension rings. What is a Tension Ring? 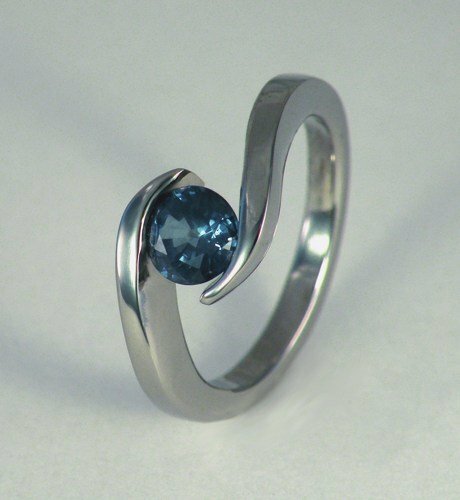 In a tension ring, the gemstone is held in place with the tension of the ring itself. It often looks as if the gem is floating without a setting. There’s no prongs or bezel holding the gem in place. The metal acts with pressure to hold the gem in place with the addition of tiny grooves on the side of the metal. Tension rings are often manufactured after they’re sold because they cannot be sized. Instead of resizing, a person with a tension ring would have to have the metal melted and the entire ring would have to be manufactured again. The tension of the ring exists because of a spring-loaded effect that wouldn’t work if the ring had to be cut for resizing. 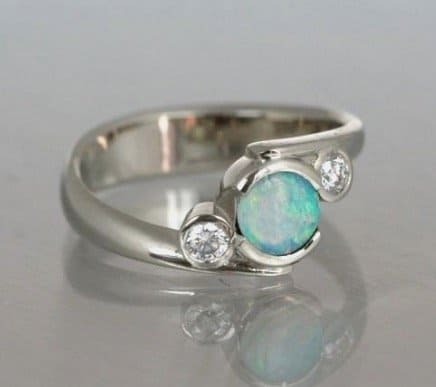 The ring isn’t created until the stone can be picked for the ring since the spring-loaded mechanism is made specifically for the stone itself. 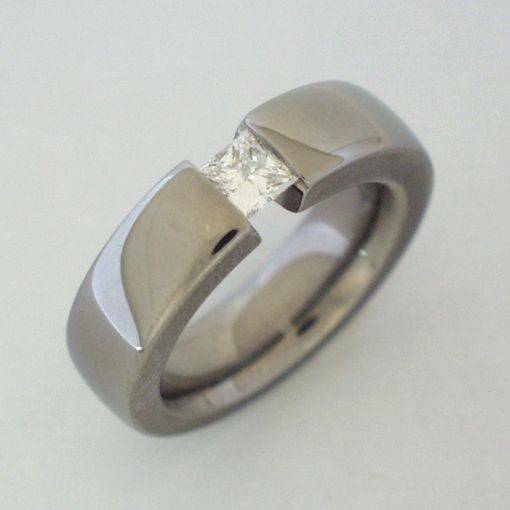 A customer would have to pick the stone before it would be inserted into the ring. It’s a process that needs calibration for the gem to stay solidly in place in the metal. The tension ring exerts over 12,000 pounds of pressure per square inch on the gemstone, so the gem that is used has to be able to withstand that pressure. The metal has to be super strong to hold the gemstone in place, too. 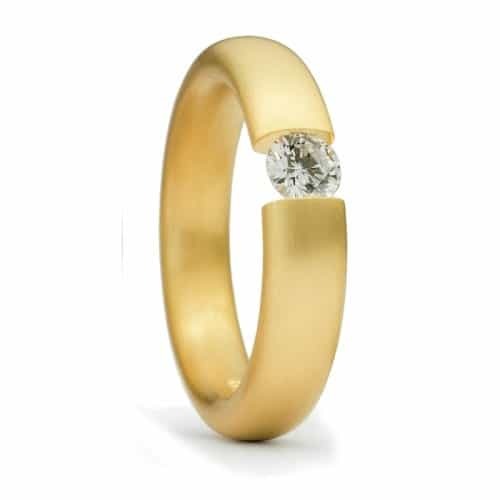 Where other styles of rings have been around for hundreds of years, the first tension ring wasn’t created until 1979. 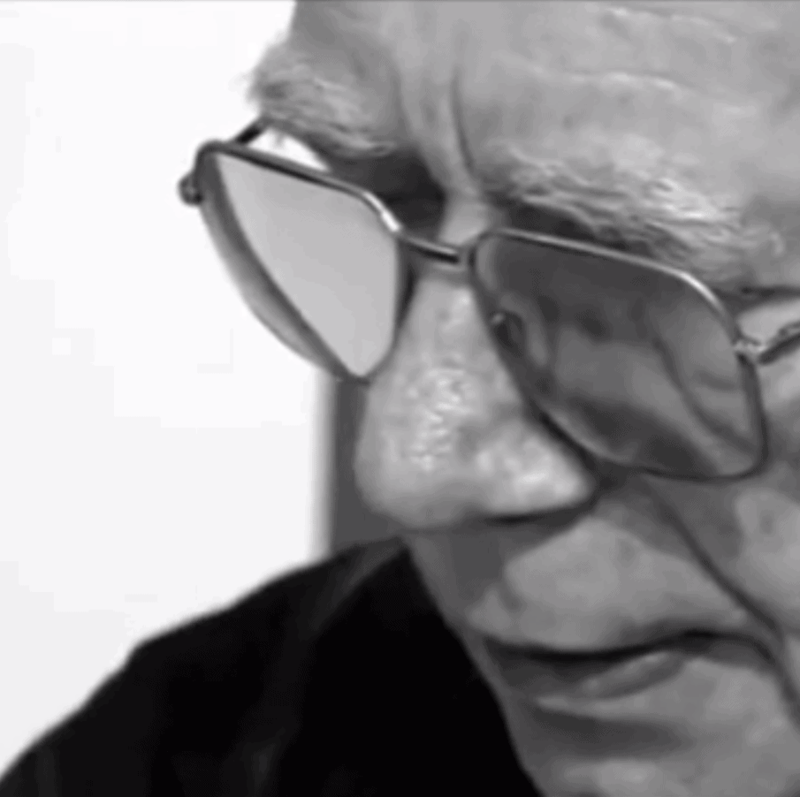 The actual concept was developed in the late 60s by a man named Friedrich Becker. The first tension ring was called a Niessing Spannring. It was made out of 18k gold. The other materials blended with the gold were what made the tension possible. With a hard metal needed for the tension, Steven Kretchmer patented an alloy called Plat/SK in 1987, which is a platinum alloy used in tension rings. He licenses this patent to companies who want to manufacturer tension rings. Tension Ring Safety: Will the Stone Stay in Place? Some jewelers warn customers that the spring loaded effect of the ring can be compromised, which will cause the stone to fall. This will only happen if there’s been some blunt trauma to the ring itself. The tension of these rings will never weaken over time like other types of rings and settings. With prong settings, they can become weak over time, and that’s why many people bring their rings to a jeweler to be maintained regularly. The best metal to ensure that the gem stays in place on the ring is titanium. It can handle the strong tension needed. 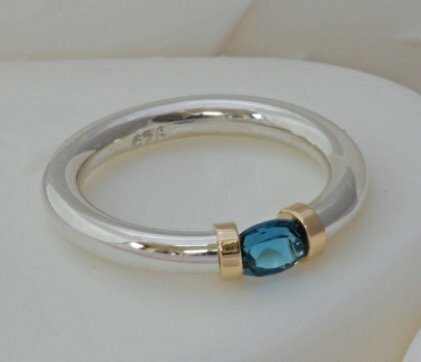 Other rings can be made of platinum, silver and gold, but they’re too soft and will need to be bulkier to hold the stone. 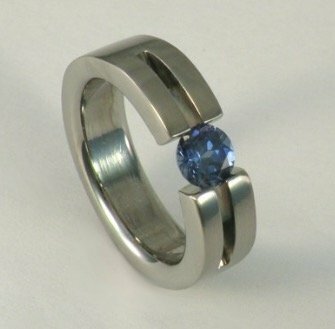 Here is an example of a steel tension ring, by ORRO Contemporary Jewelry in Glasgow. While some rings are advertised as tension rings, they have a small bridge under the stone that will hold them in place. It’s something you should be aware of when you’re searching for a true tension ring. At the same time, you might be more comfortable with a tension ring that has the small metal safety feature to protect your stone from falling. Even though it would take a massive amount of damage to dislodge a stone in a tension ring, some people feel better with that safety precaution. A faux tension ring also costs less than a real tension ring. Tension rings are often handmade, which can increase the price dramatically. Faux tension rings are mass produced, which will reduce the price for anyone who is on a budget. The casual observer won’t notice that it’s not a real tension ring. They’ll see a beautiful tension ring that is truly impressive. 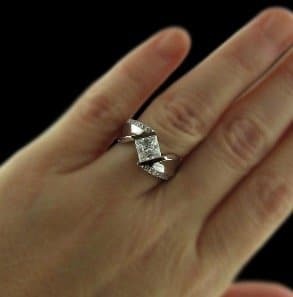 You’ll know it has a small piece of metal on the underside holding it in place, and keeping the stone from falling out of the ring. With the massive amount of pressure on the gemstone to hold it into place, the gem has to be able to withstand it. Some stones would crumble under that kind of pressure. Each stone has to be at least a 9 in hardness rating according to Mohs Hardness Scale. That includes diamonds, which are a 10 on the scale as well as Corundum, which includes rubies and a variety of different colored sapphires. Simulated / manmade diamonds like Moissanite are strong enough for tension rings too. Many people love the look of a tension ring because it lets the sparkle and shine of a diamond really stand out in the ring. For this reason, the clarity of the diamond should be high. According to the GIA clarity scale, the grade of VS2 and above is required for tension rings. Otherwise, all the flaws would be visible. Tension rings are a lovely, unusual ring that can be used for engagement rings as long as the buyer understands the mechanism of the ring, and what kind of metal and stone have to be used to have the sturdiest setting possible.